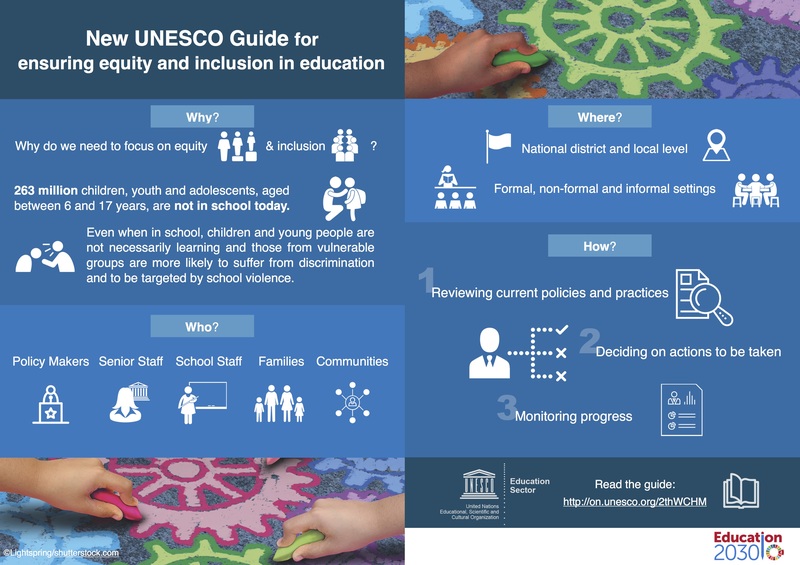 We are pleased to announce, jointly with UNESCO’s Section of Education for Inclusion and Gender Equality, the launch of the new UNESCO guide for ensuring inclusion and equity in education. Built on the premise that every learner matters and matters equally, this Guide offers practical support to Member States to review how well equity and inclusion currently figure in existing policies, decide what actions need to be taken to improve policies, and monitor progress as actions are taken. Additionally, the evidence of the progress made by other countries towards more inclusive and equitable education systems discussed in the guide will enhance Member States understanding on effective inclusive and equitable practices. Find out more by consulting the online Guide for ensuring inclusion and equity in education. If you are interested in inclusion, you can also refer to IBE training tool “Reaching out to All learners: A Resource Pack for supporting Inclusive Education” (available in English) created to support the effective implementation of inclusive education at the school and classroom levels.